Day 1: Welcome to Ayers Rock! This afternoon you’ll travel into Uluru – Kata Tjuta National Park and learn about the World Heritage listed site as your Driver Guide imparts their incredible local knowledge. Take a guided walk to Mutitjulu Waterhole. Along the way you’ll view ancient rock art and learn more about the Aboriginal and European history of the region. Later, relax with a glass of sparkling wine and nibbles as you watch the rock change colour as the sun sets below the western horizon. It’s a spectacular sight you’ll never forget. After sunset, grab yourself a bite to eat from the Outback Pioneer using your dinner voucher. Today travel to Kings Canyon. You’ll stop at Kings Creek Station for a home-cooked breakfast before continuing to Watarrka National Park. 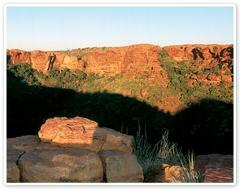 When you arrive you can take a challenging six kilometre hike, that will have you climbing up a 100 metre cliff face, followed a walk around the canyon rim, with impressive views of sandstone walls, grottos, chasms and cliffs. You may prefer to explore the boulder-strewn creek bed, an easier shady walk following the trail between the two sheer walls of the canyon. After your walk continue to Kings Canyon Resort, where you can treat yourself to lunch (own expense), before a scenic afternoon drive back to Ayers Rock Resort. Tonight, enjoy dinner at your hotel. Rise early and travel to the Kata Tjuta Dune Viewing area for spectacular panoramic views over the formations. You’ll see the morning’s first rays of sun, set the Red Centre alight. On arrival at Kata Tjuta you’ll commence the walk to the Valley of the Winds. You’ll be in awe of this natural wonder, the views are breathtaking. This walk can be a little challenging, but well worth the effort. It takes you down into a timeless haven within the domes through trickling creek beds. Your Adventure tour comes to an end in the late morning. 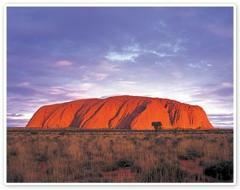 You will be offered a complimentary transfer to Ayers Rock Airport for your flight. Please Note: This itinerary is valid for travel from 1 April 2016. Uluru: Low level of fitness required. The Kuniya Walk is approximately 1 hour gentle walk on flat ground. Kings Canyon: Good level of fitness required for three hour walk around the canyon’s rim. Or low to moderate level of fitness required for the canyon floor walk. Kata Tjuta: Moderate to good level of fitness required. Valley of the Winds can be a little challenging, but shorter walks are also available for those not wanting to walk to the second lookout. Prices above may vary according to your departure date. On this Adventure tour you may travel in a large coach, with a different Driver Guide each day, so you’ll benefit from their combined knowledge and experience. Plus you’ll meet a different group of like-minded travellers each day. Please Note: Itinerary, departure dates & prices may be subject to change.